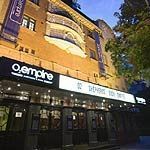 O2 Shepherds Bush Empire has been a live entertainment venue for over 100 years and is a favourite within the industry, often chosen by artists for its extraordinary level of intimacy and historic importance on the touring circuit. With a capacity of 2,000 performers can get up close and personal with their most dedicated fans. Architecturally the venue is stunning, still retaining its original design with the grandeur of its early years. Do you work at O2 Shepherds Bush Empire? What did you think of O2 Shepherds Bush Empire? I've seen some great acts at the Shepherd's Bush Empire. They attract a lot of big names and the venue is great. The Shepherd's Bush Empire is a rocking place, it can hold a huge number of people and despite the crowd it is still easy to get drinks.